Right now, Malaysians are voting in the country’s 14th general elections. For the best coverage by knowledgeable academic political scientists and others, visit New Mandala‘s Malaysia GE14 section. In my view, the story of this election is the three-cornered race: with the former opposition coalition Pakatan Rakyat dead and gone, the incumbent Barisan National coalition faces challenges on two sides. On one, the Islamist Pan-Malaysian Islamic Party (PAS). On the other, the new Pakatan Harapan coalition that replaces PAS with the Malaysian United Indigenous Party or BERSATU. Under the PR coalition, all three major opposition parties agreed not to contest one another, meaning that nearly every election was a two-party affair (fitting with Duverger’s Law) in Malaysia’s plurality-rule electoral system. But PAS no longer participates in that coalition, so there is no agreement for one major opposition party not to contest the others. The result is a three-cornered fight in most districts. In my view, the implications can be captured in four simple graphs. I made these using data from undi.info, scraped by Josh Meyer-Gutbrod for future work with Seb Dettman. 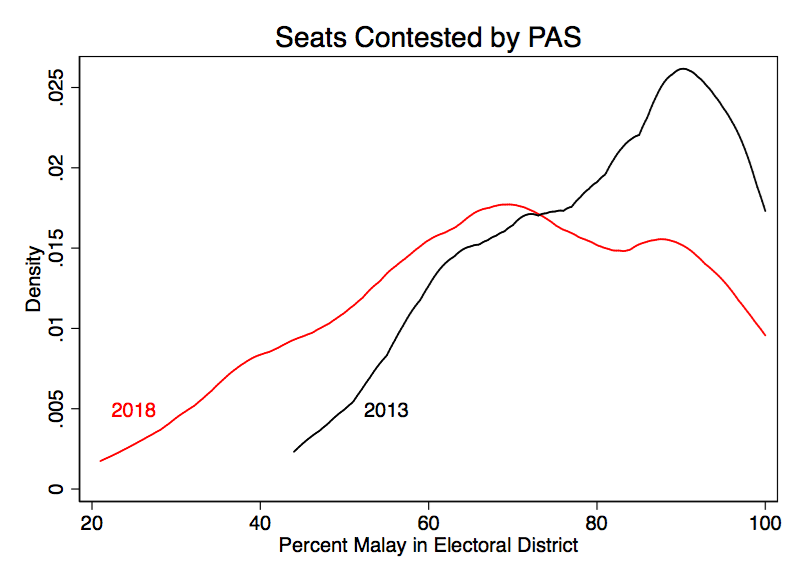 Let’s compare the types of seats that PAS contested in 2013 (GE13) versus those that it is contesting today, based on the percentage of the district’s population that is Malay. (NOTE: all of the analysis that follows is for peninsular Malaysia only.) Here is what we find. In 2013, PAS contested primarily in Malay-majority districts. This is still true, but it has taken the fight to mixed Malay/non-Malay districts as well in ways that it never had before. Compare this with seats contested by DAP, a PH party with a largely Chinese constituency. 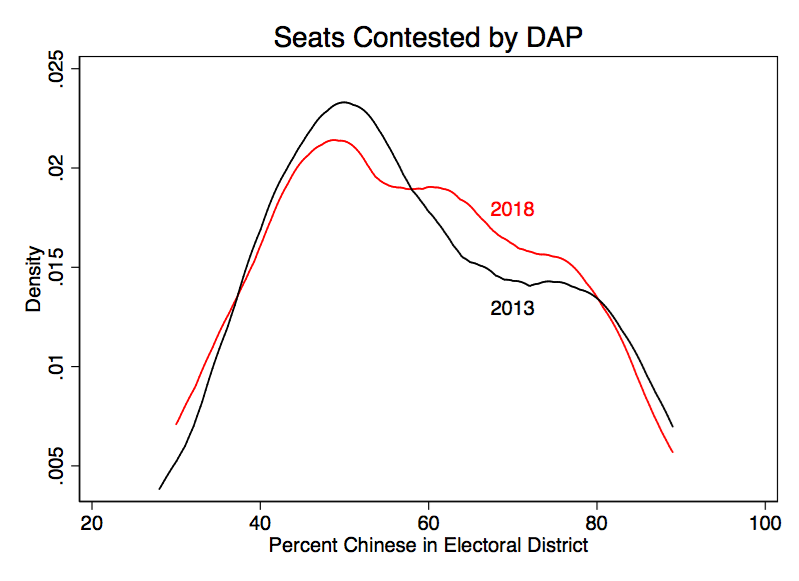 The DAP is contesting a bit more in Chinese-majority seats than it used to. This is more striking relative to PKR, a multi-ethnic PH founded by Anwar Ibrahim. 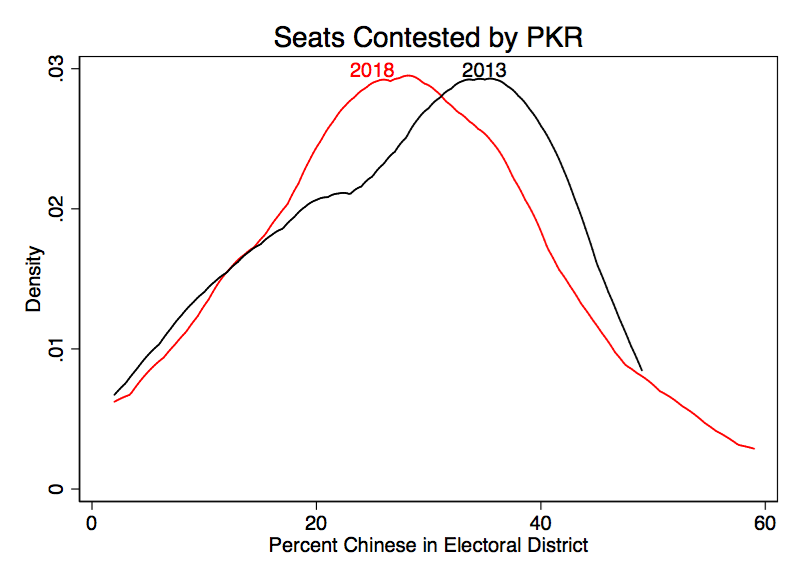 PKR is contesting in slightly districts that are slightly less ethnic Chinese than it used to. Finally, how has this affected the BN? Well, look at UMNO. 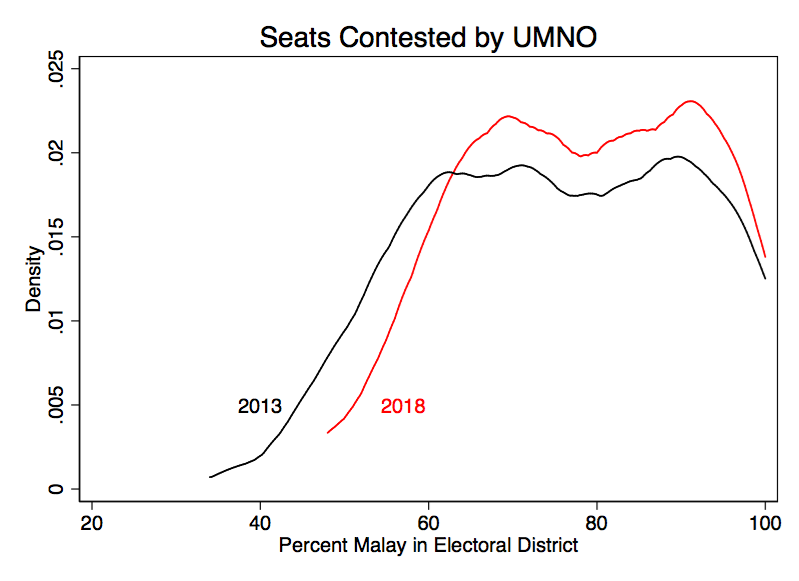 UMNO is contesting more in districts with a strong Malay majority. Now, there are two things going on here. One is the redelineation of Malaysia’s electoral districts, which has produced more “ethnic strongholds.” But also, PAS is taking the fight across most of Malaysia and this upsets the strategic calculations of the BN and PH coalitions. The story of GE14 will be what happens in these three-cornered races. Will PAS divide the opposition Malay vote and allow the BN to pull off an improbable win? Or will UMNO find itself outmatched by PAS in multi-ethnic districts that PAS had tended to concede to PKR? Something else entirely? It’s a waiting game right now; we won’t know. But in 24 hours we will know some of the answers.